To fix heartbeat, replace shocks with red light? Beams of light can replace painful electric shocks to restore normal heartbeat in people suffering from potentially fatal arrhythmias, scientists now believe. The findings, based on tests in animals and, separately, a computer model of a human heart, could pave the way toward implanting a new type of light-emitting defibrillator in patients. 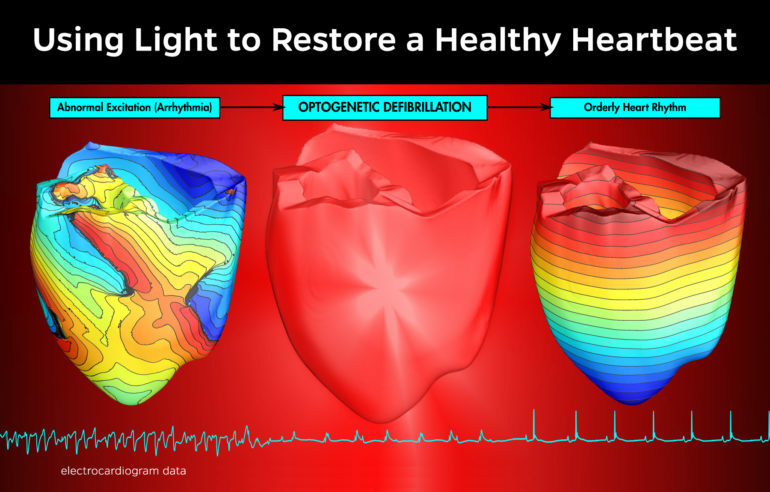 “We are working towards optical defibrillation of the heart, where light will be given to a patient who is experiencing cardiac arrest, and we will be able to restore the normal functioning of the heart in a gentle and painless manner,” says Natalia Trayanova, a biomedical engineering professor who supervised a part of the research at Johns Hopkins University. Today’s defibrillators deliver pulses of electricity that hurt and can also damage heart tissue. Light-based treatment would provide a safer and gentler remedy for patients at high risk of arrhythmia, an irregular heartbeat that can cause cardiac death within minutes. Could light beams replace pacemakers? The idea springs from advances in the field of optogenetics, in which light-sensitive proteins are embedded in living tissue, enabling the use of light sources to modify electrical activity in cells. To move the proposed treatment closer to reality, scientists took different approaches. A team from the University of Bonn in Germany conducted tests on beating mouse hearts whose cells had been genetically engineered to produce proteins that, when triggered by light, act to alter electrical activity in the organ. A one-second light pulse applied to a mouse heart in ventricular fibrillation was enough to restore normal rhythm. To find out if the technique could help human patients, the team at Johns Hopkins performed an analogous experiment, but not with a real heart. Their human “heart” was a detailed computer model derived from MRI scans of a heart attack patient now at risk for arrhythmia. “Our simulations show that a light pulse to the heart could stop the cardiac arrhythmia in this patient,” says Patrick M. Boyle, a Johns Hopkins biomedical engineering research professor who was also a lead author of the journal article. But researchers found that the process would need to be tweaked slightly for humans. The blue light used by the Bonn team in much smaller mouse hearts would not be powerful enough to fully penetrate human heart tissue. Red light, which has a longer wavelength, was more effective in the computer-based human tests. This aspect of the study highlights the important role that computational modeling can play in guiding and accelerating the development of therapeutic applications for cardiac optogenetics, a technology that is still in its infancy, Boyle says. More research is required before the promising technique can become a commonplace medical procedure, says Philipp Sasse, a junior professor at the Institute of Physiology I at the University of Bonn. The study was supported by the German Research Foundation, the University of Bonn, and the US National Institutes of Health.